From its headwaters at Paradise Lake in the Cloquet Valley State Forest to its mouth in Lake Superior, the Sucker River drops 830 feet. Numerous waterfalls typical of North Shore streams mark its descent, but it is some of the other natural characteristics of this watershed that make it special. They have led to MNTU, the MN DNR, the University of Minnesota-Duluth and many others to work to improve the habitat throughout the watershed. A medium-sized river on the North Shore, the Sucker River contains over 50 miles of streams within its watershed. The vast majority of the upper watershed is publicly held land, which bodes well for the long-term stability of the river. Forests make up most of the area feeding the river with 25% of the remainder in wetlands. This allows for greater stream stability and recharge compared to neighboring watersheds. Fortunately, only 5% of the land within the watershed is developed, grassland, or in agriculture. High elevation areas within the upper watershed capture more precipitation than surrounding watersheds, which may provide more water to the river. Comparatively, some local streams like Amity Creek have only 3% of their watershed in wetlands and over 25% in open or developed areas. The Sucker River hosts many different wild and naturally reproducing trout and salmon species, including native brook trout, brown trout, steelhead, pink salmon and chinook salmon. Brook trout spawning success is consistent and good, and the river is not stocked. 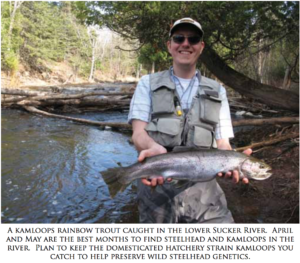 Kamloops rainbow trout regularly stray into the river in spring and are a popular target for anglers. Habitat improvement in the Sucker River has taken two primary forms: in-stream habitat creating deeper water and overhead cover, and tree planting to add shade and diversify the riparian forest. Work began in 2010 with the forestry project downstream of the northern McQuade Road bridge. Large white pine logs were added to the stream for woody cover, and rock weirs were created to assist in maintaining deep pools. This site has served as a research project location for UMD and other institutions to examine how effective habitat improvement has been and how we can better design it for other locations around the North Shore. 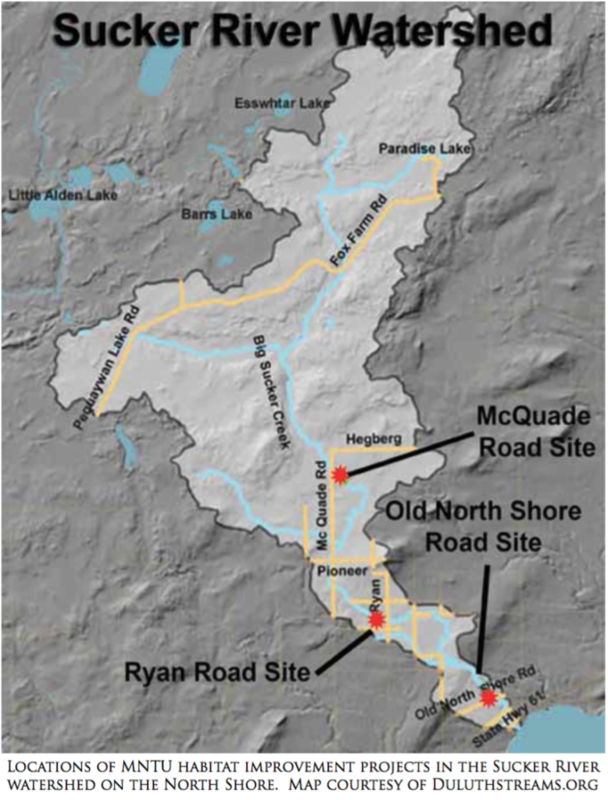 After the installation of the first project, additional Outdoor Heritage Fund and GLRI (Great Lakes Restoration Initiative) funding was secured to work on two more project locations in the watershed upstream of Ryan and Old North Shore Roads. These two sites are further downstream in the watershed and are accessible to lake-run fish including steelhead, coaster brook trout, brown trout and others. The latest project areas have also focused on providing deep water cover for both adult and juvenile fish, including wild steelhead smolts. Smolts have been observed using the habitat work in the Old North Shore road reach nearly continually after its installation. Habitat work in the form of tree planting has added over 10,000 trees to the watershed over the past 4 years. Species diversification has been a priority since many of the forested wetlands in the Sucker River watershed contain black ash trees. These ash trees are expected to be hard hit by the emerald ash borer when it arrives. Tree species planted include white pine, white cedar, red pine, bur oak, sugar maple, silver maple, tamarack, eastern hemlock and others. White pine and white cedar trees have been caged to prevent deer browse. Trees have been planted at all three in- stream habitat improvement sites as well as on other on locations in the watershed on both Carlson and Brophy Creeks. Visit the new forests at any of the sites. Plantings are easily accessible at the Old North Shore road parking area, located on the east side of the former bridge site. There are many seasons and opportunities to take advantage of on the Sucker River. From steelhead in the spring to pink salmon in the fall, it offers a small sample of the variety that is available on many of Minnesota’s North Shore waters. The steelhead run starts off the season, and the Sucker is one of the earliest streams on the shore to feature productive fishing. Plan to head north and start fishing after the first large snow-melt has occurred and the stream temperatures have started to warm toward the upper 30’s. The parking lot located along the “Scenic Route” highway can get crowded when the fish are in, but it can be worth your time and trouble when the fish are biting. Fishing with egg flies, nymphs and spawn sacs are all productive methods to try depending on your preferences. Usually a nine-foot fly rod in either 7 or 8-weight is good option to target these sh. The hatchery strain Kamloops rainbows often appear at the same time of the season, and can be common in the river at times. They can be differentiated by the lack of an adipose (small, fat) fin behind the dorsal fin. These fish are stocked to caught and kept and hybridization of these domesticated fish with wild steelhead would harm steelhead fitness and genetics. Please plan to keep them if you catch them. Further upstream in the Sucker River, brown and brook trout mix in miles of classic riffles, runs and pools. Waterfalls are scattered throughout the middle of the river and offer scenic fishing locations. The Ryan Road habitat improvement location is located in the middle of this reach, and offers good fishing in early summer and early fall. Water levels can drop low in most North Shore streams, and fish can be hard to catch on the hottest of days when the river warms into the low 70s and stresses the fish. Use nymphs and streamers to target larger fish, and small dry flies to get fish up on the surface. Caddis flies are the most common hatching insect, though some plentiful mayfly hatches occur in June. Anglers using spinning gear may wish to avoid using treble hooks and crimp the barbs to allow for easier release of the fish. The headwaters of the Sucker River are a great fishing option for wild brook trout. Bridge access points on McQuade and Fox Farm Roads offer access to many miles of publicly fishable waters protected by easements. Look to deeper areas and old beaver meadows to hold some of the biggest fish. Fishing is good in the late spring and early summer and can be good all summer long if the North Shore has had adequate rainfall, though in July the mosquitoes can carry you away in the upper sections of this and other area rivers. Since sections of this river are remote, plan to do some hiking to find the best spots. Small streamers are popular flies to entice the brookies out of their dark holes, though some anglers have had good success with the big fish on dry flies. Practice catch and release for the brook trout in this stream to allow the population to grow and the large fish to provide others with a good shot at nice fish. Though the river can produce quality sized fish, they are not great in number and it is very easy to over-harvest them.